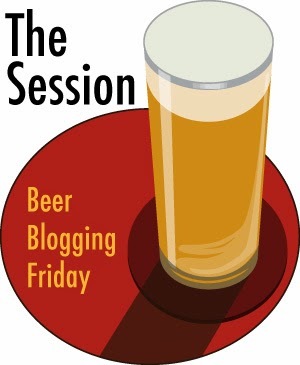 In this months session, Joan from the blog: Birraire asks us - Festivals: Geek Gathering or Beer Dissemination? That's interesting as a question but it's missing something fundamental which I will get to in due course. When I go to a beer festival, I go as a beer geek and I do ponder and fuss over the beer a little. I do what Budweiser doesn't want me to do. I say a little because I tend not to do very much of that sort of thing at beer festivals. The reason is simple. In order to fully taste a beer, you need a full measure. Sometimes more than one. That's something you can't have at a beer festival because if you do, you will not get to taste very many beers before falling on your face. I tend to congregate around fellow beer geeks to talk about the beer, see what they've had that I should look out for and generally have a good time with beery friends. I also enjoy talking to the brewers themselves at beer festivals in which they serve the beer themselves. These are my favourite types of events. Are beer geeks the biggest audience for a beer festival? In my experience, no they/we are not. That brings me to the missing part of the question. Simply drinking! A better word for a beer festival is a drinking festival. What I mean by that is you do of course drink but when people go drinking, they usually do so socially. So a beer festival is a social gathering of people consuming the best social lubricant of them all: Beer! That's how I treat a beer festival. It's a lot of fun, I meet lots of people, I make new friends, possibly even some enemies(could happen I suppose) and I try lots of beers but above all, I don't take it very seriously. If you are at a beer festival to be serious with note paper and pen, you would be better off at a quiet pub or at home with bottles you have purchased where you can give the beer you full and sober attention. Personally, I don't enjoy trying to take tasting notes at a beer festival and prefer to simply enjoy my time. You could say that going to a beer festival is a bit like a vacation. I down tools and simply enjoy myself and that's what a beer festival should be about. Enjoying yourself and good company along with good beer. It's just as well I go to lots of awesome super-secret beer festivals that you never find out about. No one judges me about my notebook there. Thanks for your contribution, Reuben. I used to bring my pen and paper to Festivals, but I don't anymore. Now I sometimes scribble a couple of thoughts on my phone, but they're not necessarily beer-related. Having attended quite a lot of local festivals, I have learned to enjoy the company of fellow drinkers from all around and getting to know the brewers. After all, you don't get to taste a beer good enough until you've drunk some. The beers you drink in festivals are like a movie teaser. Then it's up to each of us to go the cinema for the full experience or not. Cheers. A like minded soul. Thanks for hosting. To be honest, I sometimes do take some notes at the beginning of a beer festival. When it's quiet and I'm just starting out but I give up after a few and just enjoy myself then and leave the real beer geekery until there are less distractions.